Subira is a Kenyan film set in Lamu and Nairobi that’ll hit the theatres on November 29th and just so we’re clear from the onset, you’re going to want to save that date or you’ll be looking for ways to bend your leg at an angle that allows you to give yourself a swift kick to your backside. You’ve been warned. The film is a passion projected for the writer, director and producer Sippy Chadha. It took her four years to write and another four to film it and the quality of the picture, the story and the performances are a testament to the commitment and diligence that went into this film. 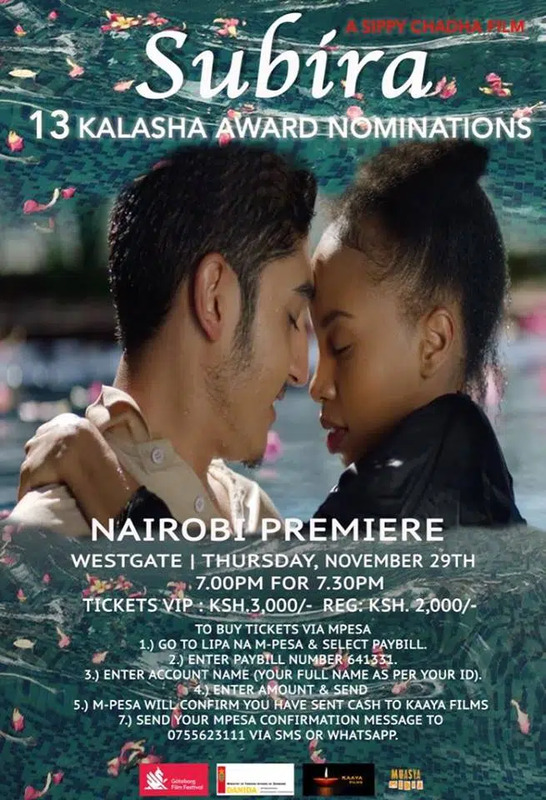 Subira the film follows Subira the title character, played flawlessly by Brenda Wairimu as she goes from a playful, pre-teen daddy’s girl to a married eighteen-year-old contending with numerous societal constraints particularly relating to gender performance. Tirath Padam, Brenda Wairmu’s co-star is a hair stylist turned actor who is a pure delight on screen. He plays Taufiq a Kenyan-Indian who is according to his father and the rest of his conservative Muslim community, way too liberal particularly in his views on women. Look out for this new talent. Maybe I’m just way too easy and sappy, but I’ll say this at the risk of y’all’s judgment when he looks into the camera and smiles, it feels like he’s smiling just at you and that’s a heady feeling right there. You can judge me now. The seasoned Nice Githinji plays Subira’s mom in a performance that if there’s any justice in the world at all should see her win that Best Supporting Actress nomination at the Kalasha Film Festival. The intricacies of mother-daughter relationships are touched on delicately and with so much vulnerability. The cinematography is something else altogether. It’s pure perfection. Scenic views of Lamu fill the screen and you leave the theatre desperate to pack your bags and go to Lamu. The Swahili culture is accurately and beautifully depicted from the family dynamics to the food to the cultural dance and music associated with weddings. The cast absolutely nails the Swahili language, particularly Nice Githinji. It’s a beautiful depiction of the culture even as the film interrogates heavy themes like gender roles. The film shows the freedoms that men have where women only have constraints and pressure to conform or bring shame upon themselves and their families. The film touches on the connection between gender and economics and the ways in which women remain heavily dependent on men in most circumstances. Marriage particularly arranged marriages and the strains that are unique to polygamous situations are also touched on. A film that does not shy away from tackling such heavy topics is one that deserves a look-see. Subira is a coming of age story. It’s a story about taking control of your life, regardless of what little control you may have, there are choices you can make and it behoves you to make them. Who among us hasn’t felt that ache at the pit of your stomach indicative of how helpless and out of control of you feel about your own life? I could go on and on, let’s just say it’s a relatable excellently executed film with 13 Kalasha nominations to back that statement up. Plus it’s a gentle love story and full disclosure, I’m a total sucker for romance. Did I successfully whet your appetite? Go watch it or you’ll have no one to blame but yourself. Check out the trailer here. The film premieres on Thursday 29th November at 7p.m. – @Westgate Cinema. Follow them on Facebook Subira Feature Film for more info. If you’re itching to buy the ticket(s), follow the instructions on their page here. Or check this image out.